Let’s forget about fully autonomous vehicles for one minute and wonder: what will car interiors look like in the near future? 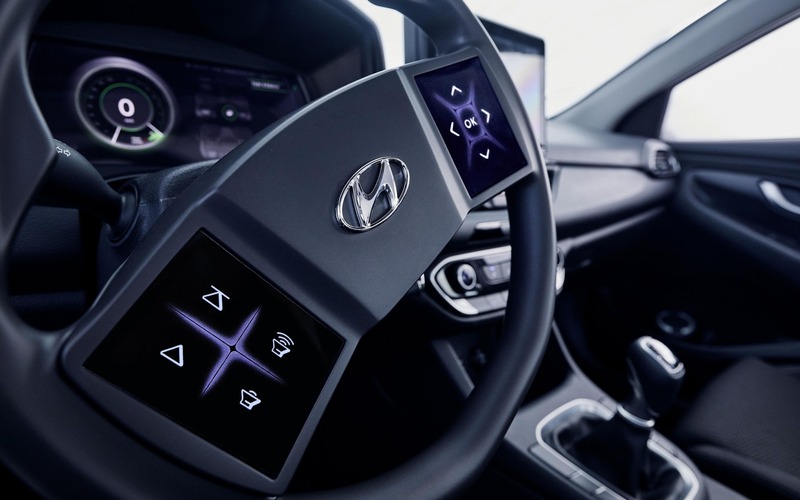 The fancy concepts unveiled at auto shows offer a cool glimpse, for sure, but for a more realistic view we can turn to Hyundai, which has just revealed its study on automotive cockpits of tomorrow by integrating the latest and upcoming technologies in an Elantra GT test car. In response to the ever-growing variety of information shared with the driver, the so-called “virtual cockpit” imagined by the company’s European technical centre is said to provide a more interactive experience and is highly customizable to suit the driver’s needs. Also: New Kia EV Concept is All About Emotions… and That Insane Cockpit! After evaluating its steering wheels and cockpits as well as those of the competition from recent years, Hyundai made a priority to reduce the number of buttons and create a cleaner interface. This has led, among other things, to the integration of touch displays with haptic feedback on the steering wheel. In the test car developed by Hyundai, the steering wheel is equipped with two sizable displays that are ergonomically adjusted. In order to adapt to the individual preferences of the driver, these displays come with a unique, freely configurable icon design that’s easy to understand and use—much like the layout of a smartphone—plus two actuator modules underneath the surface allowing for a stronger and more consistent haptic feedback, which optimises the usability for the driver. In the latest development stage, the instrument cluster display behind the steering wheel was changed to a multi-layer setup consisting of two displays that are stacked on top of each other at a distance of six millimetres to allow visual 3D effects. This effect is used to guide the user’s attention with less distraction, Hyundai claims. The information most relevant for the present situation, for example the speed limit, is shown in the front display to catch the driver's eye. The information that appears on the steering wheel displays also change depending on the current instrument cluster menu and the driving situation. All of that sounds good, but will such cockpit innovations effectively reduce driver distractions? To answer the question, the automaker conducted a separate study with the Würzburg Institute for Traffic Science in Germany. In all scenarios, apparently, the results show that Hyundai’s new cockpit is significantly below the distraction limits defined by traffic safety organizations like the NHTSA in the United States. Even in more complex cases, all test persons indicated only a slight distraction, which they didn’t perceive as strenuous or interfering with the task of driving. At this point, Hyundai is still in the early prototype phase of the new virtual cockpit, as evidenced by the run-of-the-mill interior of the test car (manual transmission FTW! ), but the company says it will integrate the results of the current trial into its future development plans. Geneva New Kia EV Concept is All About Emotions… and That Insane Cockpit!